This article is about the gemstone. For other uses, see Jade (disambiguation). Jade refers to an ornamental mineral, mostly known for its green varieties. It can refer to either of two different minerals: nephrite, a silicate of calcium and magnesium, or jadeite, a silicate of sodium and aluminium. Jade is featured prominently in ancient Asian art, but also has an important place in many other cultures. During Neolithic times, the key known sources of nephrite jade in China for utilitarian and ceremonial jade items were the now-depleted deposits in the Ningshao area in the Yangtze River Delta ( Liangzhu culture 3400–2250 BC) and in an area of the Liaoning province and Inner Mongolia ( Hongshan culture 4700–2200 BC). 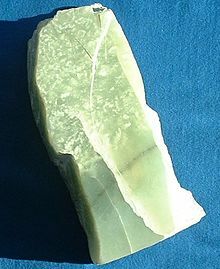 Dushan Jade was being mined as early as 6000 BC. In the Yin Ruins of the Shang Dynasty (1600 to 1050 BC) in Anyang, Dushan Jade ornaments were unearthed in the tomb of the Shang kings. Jadeite, with its bright emerald-green, pink, lavender, orange and brown colours was imported from Burma to China only after about 1800. The vivid green variety became known as Feicui (翡翠) or Kingfisher (feathers) Jade. It quickly became almost as popular as nephrite and a favorite of Qing Dynasty's nouveau riche, while scholars still had strong attachment to nephrite (white jade, or Khotan), which they deemed to be the symbol of a nobleman. The Chinese character 玉  (yù) is used to denote the several types of stone known in English as "jade" (e.g. 玉器, jadewares), such as jadeite (硬玉, 'hard jade', another name for 翡翠) and nephrite (軟玉, 'soft jade'). But because of the value added culturally to jades throughout Chinese history, the word has also come to refer more generally to precious or ornamental stones,  and is very common in more symbolic usage as in phrases like 拋磚引玉/抛砖引玉 (lit. 'casting a brick (i.e. the speaker's own words) to draw a jade (i.e. pearls of wisdom from the other party)'), 玉容 (a beautiful face; 'jade countenance'), and 玉立 (slim and graceful; 'jade standing upright'). The character has a similar range of meanings when appearing as a radical as parts of other characters. Large "mutton fat" nephrite jade displayed in Hotan Cultural Museum lobby. 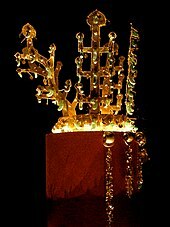 Golden crown with jade pendants from Silla, fifth or sixth century AD, in the National Museum of Korea. The use of jade and other greenstone was a long-term tradition in Korea (c. 850 BC – AD 668). Jade is found in small numbers of pit-houses and burials. The craft production of small comma-shaped and tubular "jades" using materials such as jade, microcline, jasper, etc., in southern Korea originates from the Middle Mumun Pottery Period (c. 850–550 BC). Comma-shaped jades are found on some of the gold crowns of Silla royalty (c. 300/400–668 AD) and sumptuous elite burials of the Korean Three Kingdoms. After the state of Silla united the Korean Peninsula in 668, the widespread popularisation of death rituals related to Buddhism resulted in the decline of the use of jade in burials as prestige mortuary goods. Jadeite in Burma is primarily found in the "Jade Tract" located in Lonkin Township in Kachin State in northern Burma which encompasses the alluvial region of the Uyu River between the 25th and 26th parallels. Present-day extraction of jade in this region occurs at the Phakant-gyi, Maw Se Za, Tin Tin, and Khansee mines. Khansee is also the only mine that produces Maw Sit Sit, a type of jade. Mines at Tawmao and Hweka are mostly exhausted. From to 1964 to 1981, mining was exclusively an enterprise of the Myanmar government. In 1981, 1985, and 1995, the Gemstone laws were modified to allow increasing private enterprise. In addition to this region, there are also notable mines in the neighboring Sagaing District, near the towns of Nasibon and Natmaw and Hkamti. Sagaing is a district in Myanmar proper, not a part of the ethic Kachin State. Nephrite jade in New Zealand is known as pounamu in the Māori language (often called "greenstone" in New Zealand English), and plays an important role in Māori culture. It is considered a taonga, or treasure, and therefore protected under the Treaty of Waitangi, and the exploitation of it is restricted and closely monitored. It is found only in the South Island of New Zealand, known as Te Wai Pounamu in Māori—"The [land of] Greenstone Water", or Te Wahi Pounamu—"The Place of Greenstone". Pounamu taonga increase in mana (prestige) as they pass from one generation to another. The most prized taonga are those with known histories going back many generations. These are believed to have their own mana and were often given as gifts to seal important agreements. Jade was a rare and valued material in pre-Columbian Mesoamerica. 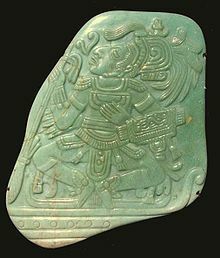 The only source from which the various indigenous cultures, such as the Olmec and Maya, could obtain jade was located in the Motagua River valley in Guatemala. [ citation needed] Jade was largely an elite good, and was usually carved in various ways, whether serving as a medium upon which hieroglyphs were inscribed, or shaped into symbolic figurines. Generally, the material was highly symbolic, and it was often employed in the performance of ideological practices and rituals. Both nephrite and jadeite were used from prehistoric periods for hardstone carving. Jadeite has about the same hardness (between 6.0 and 7.0 Mohs hardness) as quartz, while nephrite is slightly softer (6.0 to 6.5) so can be worked with quartz or garnet sand, and polished with bamboo or even ground jade. [ citation needed]. However nephrite is tougher - more resistant to breakage. Among the earliest known jade artifacts excavated from prehistoric sites are simple ornaments with bead, button, and tubular shapes. 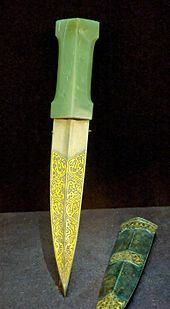 Additionally, jade was used for adze heads, knives, and other weapons, which can be delicately shaped. As metal-working technologies became available, the beauty of jade made it valuable for ornaments and decorative objects. Nephrite can be found in a creamy white form (known in China as "mutton fat" jade) as well as in a variety of light green colours, whereas jadeite shows more colour variations, including blue, brown, red, black, dark green, lavender and white. Of the two, jadeite is rarer, documented in fewer than 12 places worldwide. Translucent emerald-green jadeite is the most prized variety, both historically and today. As "quetzal" jade, bright green jadeite from Guatemala was treasured by Mesoamerican cultures, and as "kingfisher" jade, vivid green rocks from Burma became the preferred stone of post-1800 Chinese imperial scholars and rulers. Burma ( Myanmar) and Guatemala are the principal sources of modern gem jadeite. In the area of Mogaung in the Myitkyina District of Upper Burma, jadeite formed a layer in the dark-green serpentine, and has been quarried and exported for well over a hundred years. Canada provides the major share of modern lapidary nephrite. Nephrite jade was used mostly in pre-1800 China as well as in New Zealand, the Pacific Coast and the Atlantic Coast of North America, Neolithic Europe, and Southeast Asia. In addition to Mesoamerica, jadeite was used by Neolithic Japanese and European cultures. Type A jadeite has not been treated in any way except surface waxing. Type B treatment involves exposing a promising but stained piece of jadeite to chemical bleaches and/or acids and impregnating it with a clear polymer resin. This results in a significant improvement of transparency and colour of the material. Currently, infrared spectroscopy is the most accurate test for the detection of polymer in jadeite. Type C jade has been artificially stained or dyed. The effects are somewhat uncontrollable and may result in a dull brown. In any case, translucency is usually lost. B+C jade is a combination of B and C: it has been both impregnated and artificially stained. Type D jade refers to a composite stone such as a doublet comprising a jade top with a plastic backing. Heavenly Horse Tomb, a Silla royal tomb in Korea with jade artifacts. ^ "Online Etymology Dictionary". Etymonline.com. Retrieved 2011-03-07. ^ Jacobs, Andrew (September 20, 2010). "Jade From China's West Surpasses Gold in Value". The New York Times. New York: NYTC. ISSN 0362-4331. Retrieved October 13, 2012. ^ Bale, Martin T. and Ko, Min-jung. Craft Production and Social Change in Mumun Pottery Period Korea. Asian Perspectives 45(2):159-187, 2006. ^ Hung, H. C., Iizuka, Y., Bellwood, P., Nguyen, K. D., Bellina, B., Silapanth, P., & Manton, J. H. (2007). Ancient jades map 3,000 years of prehistoric exchange in Southeast Asia. Proceedings of the National Academy of Sciences, 104(50), 19745-19750. ^ Hung, H. C., Iizuka, Y., Bellwood, P., Nguyen, K. D., Bellina, B., Silapanth, P., ... & Manton, J. H. (2007). Ancient jades map 3,000 years of prehistoric exchange in Southeast Asia. Proceedings of the National Academy of Sciences, 104(50), 19745-19750. ^ Salt, Donn, 1992, Stone, Bone and Jade - 24 New Zealand Artists, David Bateman Ltd, Auckland. ^ "Pounamu taonga". Collections Online. Museum of New Zealand Te Papa Tongarewa. Retrieved 25 November 2010. ^ Keane, Basil (2 March 2009). "Pounamu – jade or greenstone – Implements and adornment". Te Ara – the Encyclopedia of New Zealand. Ministry for Culture & Heritage. Retrieved 21 November 2010. ^ "Collections Online - Museum of New Zealand Te Papa Tongarewa". collections.tepapa.govt.nz. Retrieved 26 January 2019. ^ Talbot, Matthew. "In Depth Green With Jade". Canadian Geographic. Archived from the original on 6 November 2014. Retrieved 6 November 2014. ^ "What is Jade?". Polar Jade. Retrieved 6 November 2014. ^ "Jade, greenstone, or pounamu?". Retrieved 9 October 2018. ^ Liu, Li. "The Products of Minds as Well as Hands: Production of Prestige Goods in Neolithic and Early State Periods of China". Asian Perspectives 42(1):1–40, 2003, p. 2. ^ Grande, Lance; Augustyn, Allison (2009). Gems and Gemstones: Timeless Natural Beauty of the Mineral World. University of Chigaco Press. p. 216. ISBN 978-0-226-30511-0. ^ "Tay Thye Sun, The Changing Face of Jade" (PDF). Alumni Newsletter No. 3, pp. 5 - 6. Ssef-alumni.org.